The Funky Felter: The Funky Felter's Blog Contest Giveaway! A Handmade Felted Flower Ring in Your Choice of Colors! Whoohoo!! The Funky Felter's Blog Contest Giveaway! 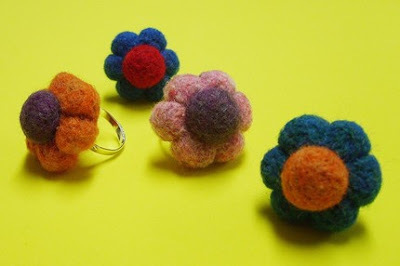 A Handmade Felted Flower Ring in Your Choice of Colors! Whoohoo!! It is finally time for my first blog contest giveaway! You have a chance to win a custom color felted flower ring. So what do you have to do to enter? The winner will be chosen through Random.org at the end of next week on Friday, August 8th. There will be a post that day announcing the lucky, lucky winner! i love the silver dawn pendant! pretty stuff! going to blog your giveaway! and signed up for subscription, by the way! I love your heart shaped rings! I haven't seen anything like them before and anything to Spread the Love is the way to go. :) Your flower rings are really adorable as well and you have a great selection of colours. I'm adding you to my favorite stores. :) Peace! You have some neat items in your Etsy store! I love the heart shaped rings! Very cool-they're unique! I subscribed to your Newsletter! i would love to be in this contest. the power in the colors of the felt are amazing. But the rings are just adorable too. I have always wanted to learn to felt. I love your entire shop, but here is one of my fav's. hey, if you want to know how to get a LOT of people to come to your giveaway, convo me. I know a secret or two. It was really hard to pick just one, but I would have to say this http://www.etsy.com/view_listing.php?listing_id=11918209 is my favorite item. I love pendants, I love felt, and I love the colors you made this with. Beautiful! I see your things at Crown Center! I am a huge ladybug fan!!!! I love these. I've never seen anything like it. My favorite was the Orbiting Moons - A Fiber Art Pendant. That is just too cool. I marked it as a favorite etsy seller now since I like the goodies so much. I also subscribed to your email. This is gorgeous~ it looks like a southwestern sunset!